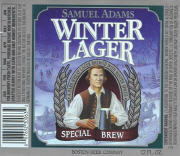 Apprehensive winter seasonal brings dark bock essence and immutable fruity waft to malted wheat undercurrent, making this copper-hued ’97 batch better than its ’96 predecessor. Overripe raisin, tangy cherry, tart orange, and silken spices penetrate mildly creamy finish of tinnier autumnal ’03 version. 2010 version: Metallic front end depletes vegetal-spiced ginger snap, brown-sugared cinnamon-nutmeg fade, and mandarin orange zest for sour-creamed tangelo spicing to toasted bread spine. 2011: Phenol hop spicing and vegetal fruiting are problematic. 2017: Unspecific orange-peeled cinnamon and ginger spicing only casually sweetens the front end while peaty Scotch-daubed tobacco roast fades beneath fizzy carbolic spritz.